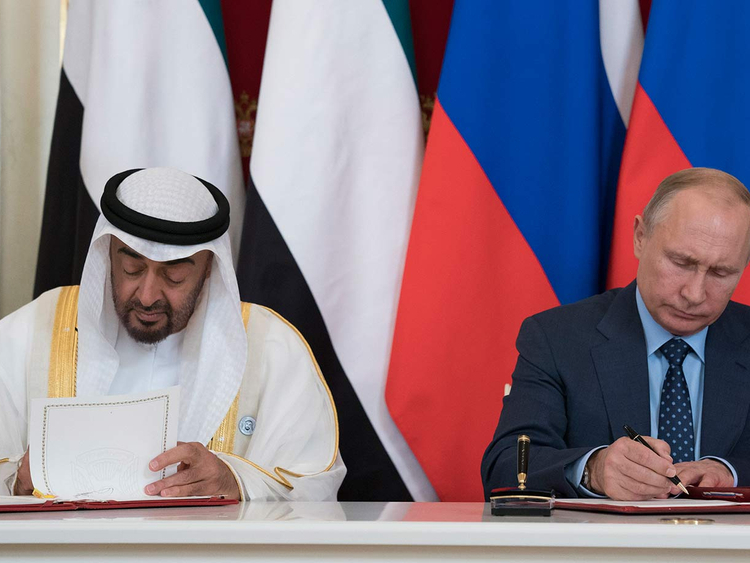 Moscow: The UAE and Russia signed on Friday a Declaration of Strategic Partnership to cooperate in various sectors such as politics, security, economy and culture, along with cooperation in the humanitarian, scientific, technological and tourist domains. The declaration was signed by His Highness Shaikh Mohammad Bin Zayed Al Nahyan, Abu Dhabi Crown Prince and Deputy Supreme Commander of the UAE Armed Forces, during his two-day visit to Russia. Russian President Vladimir Putin signed the declaration from the Russian side. The declaration is conducive to strengthening dialogues between the two counties on bilateral, regional and international issues of common political concern. The signing of the declaration translates both countries' determination to develop bilateral relations into a fruitful strategic partnership across all areas of mutual interest. It features regular consultations between the foreign ministers of both countries to coordinate stances vis-a-vis issues of common concern. 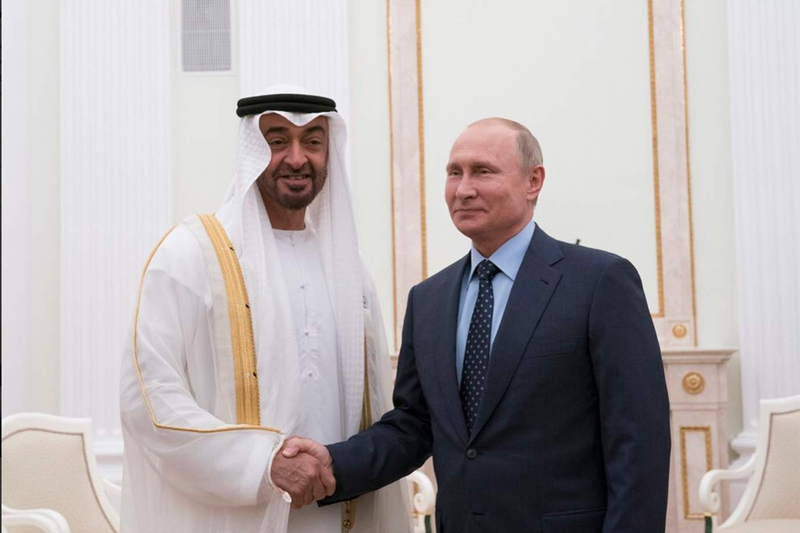 While meeting the Russian President in Moscow, Shaikh Mohammad Bin Zayed held official talks with President Putin, discussing cooperation and friendship relations and the latest regional and international issues of mutual concern. The Russian President welcome Shaikh Mohammad and the accompanying delegation saying, “We welcome you to Moscow. We have met a year ago and since then, the region and the world have witnessed rapid developments. I am happy to have the opportunity to discuss with you ways to strengthen bilateral relations and developments in the region. "The UAE has been a close partner for us in the Middle East for years, and today we will sign a Declaration of Strategic Partnership as a further step in strengthening our relations." Putin said the two countries’ relations have developed significantly at the political, security and economic levels over the past period, with the trade and investment exchanges consistently hitting fresh heights. "We have a large number of joint projects, joint interests. I do hope and believe that today's visit will contribute to strengthening our mutual relations," Putin said. Mohamed bin Zayed arrives in Moscow for a two-day visit during which he will hold talks with Russian President Vladimir Putin. The two countries will continue to work hard together across the energy domain, Putin said, noting that the efforts made by his country, UAE and Saudi Arabia along with OPEC member states have helped restore stability to the global oil market. Shaikh Mohammad said he was pleased to visit Russia. He also expressed appreciation to President Vladimir Putin for his support to the efforts being made to take the UAE-Russian cooperation to new levels. He conveyed to President Putin greetings of President His Highness Shaikh Khalifa Bin Zayed Al Nahyan and his wishes of further progress and prosperity to the people of Russia. President Putin reciprocated the greetings, expressing his best wishes to the people of the UAE. Shaikh Mohammad said: "We are pleased to be here in Moscow and to meet with you. Our relations are very important and we emphasise the keenness to develop them. We are also pleased with the rapid growth in trade exchange and we are confident that it will hit new heights after declaring the strategic partnership between the two countries." "We have witnessed lots of developments in the Middle East since we met last year. We in the UAE, along with our friends and the international community at large, look forward to a brighter future in the Middle East," he added. Shaikh Mohammad indicated that the UAE, under the leadership of Shaikh Khalifa is keen on enhancing ties of friendship and cooperation with Russia in all fields, adding that relations between the two countries are based on a solid foundation of mutual interests and they are witnessing a remarkable progress, thanks to their leaderships' keenness. He said the regular meetings between leaders of the UAE and Russia are stemmed from the mutual willingness to continue the consultations on means to further drive bilateral cooperation in various domains. "Russia is major country that plays a vital role in maintaining regional and international security and stability. It is necessary that we maintain a continuous coordination with Russia on regional issue to ensure security and stability." Shaikh Mohammad referred to the joint interests between the UAE and Russia, including their firm stand against the scourge of terrorism and extremism, which is considered a global threat that requires further coordination and cooperation at the regional and international levels to combat it. He also said the UAE is continuously contributing to regional and international security and stability through its proactive cooperation with the world powers, including Russia, which has strong bonds with the region. The meeting discussed relations between the UAE and Russia in economic, investment, commercial and political fields and the ways to strengthen cooperation, particularly in economic fields. Also discussed were the latest regional and international developments and the situation in the Middle East. Attending the meeting and the signing were Shaikh Tahnoun Bin Zayed Al Nahyan, National Security Adviser; Dr. Anwar Bin Mohammad Gargash, Minister of State for Foreign Affairs and Khaldoon Khalifa Al Mubarak, Chairman of Abu Dhabi Executive Affairs Authority. Attending from the Russian side were Sergey Lavrov, Minister of Foreign Affairs; Yuri Ushakov, Advisor to the President of the Russian Federation responsible for international affairs and Denis Manturov, Minister of Industry and Trade.